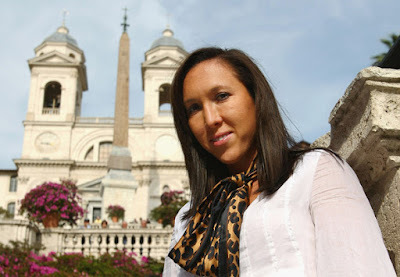 Jelena Jankovic took time out while competing at the Italian Open to do some shopping at the GF Ferre boutique and visit the Piazza di Spagna or better known as the Spanish Steps in Rome. Her mom Snezana accompanied her during the photo shoot. Coming back to the court, Jankovic was leading 6-1, 1-0 when Kateryna Bondarenko called for the trainer and withdrew because of flu yesterday. They were on court for only 35 minutes. “I would have loved to finish the match, because I was playing pretty well in that first set,” Jankovic said. Jankovic will play Svetlana Kuznetsova next, who ousted crowd favourite Flavia Pennetta 6-3, 3-6, 6-0.